Cheryl Boyce-Taylor’s Arrival is a much-anticipated poetry collection by the Trinidadian-born writer. Here, Cheryl is interviewed by Keisha-Gaye Anderson at the Five Myles Gallery in Brooklyn, NY, on June 14, 2017. The poems are road maps connecting one generation to another. The narrative begins in 1950 with a woman who is pregnant with twins. In her seventh month she delivers a stillborn boy, and a baby girl weighing less than two pounds. During this tumultuous period the father leaves the family and has an affair. Thanks to Five Myles Gallery and Donna Lee Weber for the video. 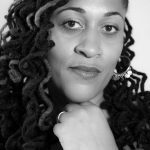 Keisha-Gaye Anderson is a Jamaican-born poet, author, visual artist, and media professional living in Brooklyn, NY. Gathering the Waters (Jamii Publishing 2014) is her first poetry collection. She is a past participant of the VONA Voices and Callaloo writing workshops, and was short-listed for the Small Axe Literary Competition. 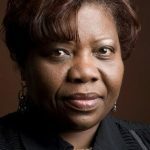 Her work has been published widely in literary journals, including The Mom Egg Review, Renaissance Noire, Mosaic Literary Magazine, and African Voices Magazine. Keisha received her M.F.A. in creative writing from The City College, CUNY. Follow her @KeishaGaye1.